Defender who won three consecutive gold medals as a member of the U.S. women's soccer team at the 2004, 2008 and 2012 Olympics. She also helped the team capture gold at the 2015 World Cup. She began playing for Sky Blue FC in 2013. She attended Monmouth University, where she earned a degree in Special Education. 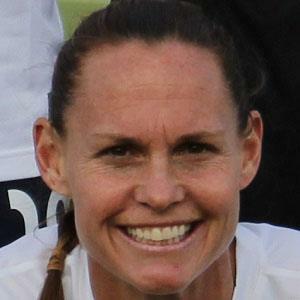 Rampone is the oldest player to compete in a FIFA Women's World Cup game. She married Chris Rampone on November 9, 2001. The couple has two daughters, Rylie Cate and Reece Elizabeth on March 6, 2010. She played with Mia Hamm in Hamm's final Olympics, the 2004 Athens competition.